Scientist Taro Smith marine conservationist, underwater photographer and Amy Ippoliti, Yoga therapist, worked to get the shot below. It got captured when the copartner Amy was descending in water in the Yogic lotus posture. At that time, the 680 kilos ‘ Menta Ray swam passed her. Amy says,” Without sharks, the balance of the ocean’s food chain gets severely threatened. At the rate things are going, we’re set to extinguish sharks entirely in only 10-20 years. The foremost predators, sharks keep the populations of everything else in the food chain in balance.” All these enthusiasts are working together for awareness to save the marine life. Their team conducts regular programs to demonstrate their commitment to conserve sea life through underwater Yoga. Practicing Antara and Bahya Kumbaka Pranayama (breathing exercises and pranayama, that is breath out after exhalation or inhalation) under water, and raise awareness of shark conservation in the yoga community and beyond. Whale sharks are by far the world’s largest living fish, gets threatened by the declining health of the oceans, and the trading of their body parts. Manta Ray species gets haunted because of their commercial value it. It gets regularly procured by the organized sector in a very significant numbers. The fishing industry goes for harvesting the gill rakers used by Mantas for the food collection like plankton and snapper eggs. The Chinese are ever ready to consume the large fish, believing that the gill rakers cure many diseases that still lacks the proof. Manta Ray is a big fish with the large body, broad head, and somewhat triangular fins spread from the chest outwards continuing from the mouth on both sides. The body typically flattened with the eyes located on the sides of the head beyond the fins. The gill slit on the sides.The tail is missing from their disc-shaped body. 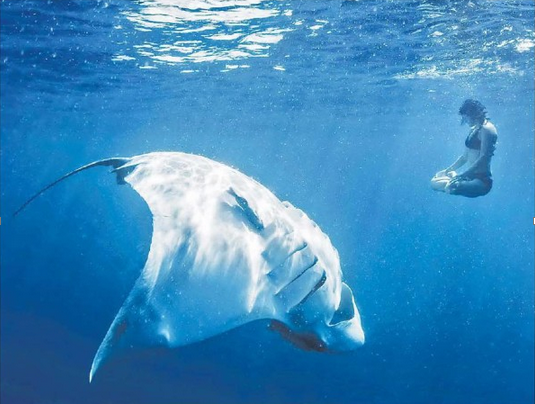 The Manta Ray may weigh up to a mighty 1350 kgs, and their width could be anything between 5.45 meters and 7.0 meters. Manta rays well known for their large size, broad heads, triangular pectoral fins, and the horn-shaped cephalic fins located on either side of their mouths. Their tails lack skeletal support and are shorter than their disc-like bodies. The dorsal fins are small and at the base of the tail. 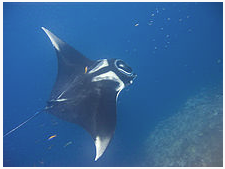 The width is approximately 2.2 times the length of the body; M.birostris reaches at least 7 m (23 ft) in width while M.alfredi reaches about 5.5 m (18 ft).Manta rays are threatened because they are being harvested around the globe by organized fishing programs in unsustainable numbers. Amy Ippoliti being an Ocean Conservator suggests a few of the ways the aqua world of fish may be saved. Today we have knowledge that fish, in general, is getting consumed at an alarming rate because of the selfishness of human beings. Time is not far off when depleting natural resources, such as the fish (water) and animals (land) would reflect and make him suffer for the wrongdoing soon. Here are just a few easy actions to take to conserve the marine life.
. Stop eating fish or at least use the App, ‘Seafood Watch’ to choose the nondepleting fish.
. Read and understand the pet food label for ecology preservation.
. Don’t go the Chinese way of having shark fin soup, in fact, a stand should be taken to influence the public at large.
. Go organic in having food that gets grown organically. Vegetation-based food needs to be given to livestock.
. Always buy organically produced farm products. It will save our rivers and oceans and the fish.
. Refrain from using sea world or parks for amusements. They only prolong and tease the marine life from the environment of the natural life they lead. Don’t buy the tickets thus sold. • Watch the movie, The Cove and join efforts to stop the mass slaughter of dolphins.
. Always use the reusable water bottle and ask others not to use the plastic water bottle or drinking container.
. Refrain using disposable plastic plates and cups, the containers should be bio-degradable. Your awareness will make other realize to help in conserving the animal world in the air, water, and soil.
. Carry your cloth tote or another reusable bag while shopping.
. As far as possible recycle everything you use. Amy and Taro work together as the environmental team to save sharks and marine life. There needs to be a mass awareness as how to conserve the depleting sea fish and animals. The info is available in short films like ‘ Blackfish’ to understand more about why it’s so important to keep shark whales and dolphins wild. The info is available in short films to understand more about why it’s so important to keep whales and dolphins wild. Blackfish is a 2013 documentary directed by Gabriela Cowperthwaite. The film premiered at the 2013 Sundance Film Festival on January 19, 2013, and was picked up by Magnolia Pictures and CNN Films for wider release. Blackfish focuses on Tilikum, an orca held by SeaWorld and the controversy over captive killer whales.Via. Few logical and thoughtful practices need following by one and all for doing the right for the ecological balance. There was a time when the open sea got used as dumping ground for all the refuse inland. The sea charts gave their exact position outside each sea harbor of the world. But NO more of this is allowed anymore, except the bio-degradable waste, that gets jettisoned with proper records.